Hello! Today the Paper House Productions team has tried out some stamps from My Sentiments Exactly. I received the friendship stamp set. 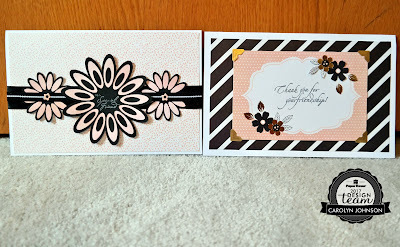 I decided to make two cards using the Be Happy Paper Pad. I folded 8.5" x 11" white cardstock in half and adhered a background paper. Then I used my Silhouette Cameo to cut out the flowers. I used some black ribbon and stickers that came with the paper pad. To finish it off I used a stamp with white ink. On the inside of the card, stamped another sentiment. For the second card, I repeated the first step and then adhered a cut apart card from the paper pad. I fussy cut some flowers from another copy of the cut apart card to balance the card. Then I used a stamp with black ink for the sentiment. The photo corners are from a previous swap with Scrapbook Adhesives.